The election results last November appeared to put to rest the KKK charges against reform members of the City Council by their Old Guard council rivals, if for nothing more than the reality of the sweep extinguishing the fire of Vision Money/Money dancing in their eyes. The dream however isn't dead. It lives on while the most vulnerable people in Hoboken are availed for exploitation. Hoboken is not a mere isle of dignity in a county known for corruption. It also hosts a third world banana republic in the corner of town with a contracted self-appointed leader "for life" - or so he thinks. How else to explain this 'officially' approved poster on the first floors of Hoboken Housing Authority buildings? An "official" posting all over the first floor of HHA buildings. HHA Carmelo Garcia endorses this race baiting message of lies and hate. Is this a "call for action" or a call for a mob? It's hard to tell the difference. But it's "official" and "approved" propaganda sanctioned by HHA Executive Director Carmelo Garcia. 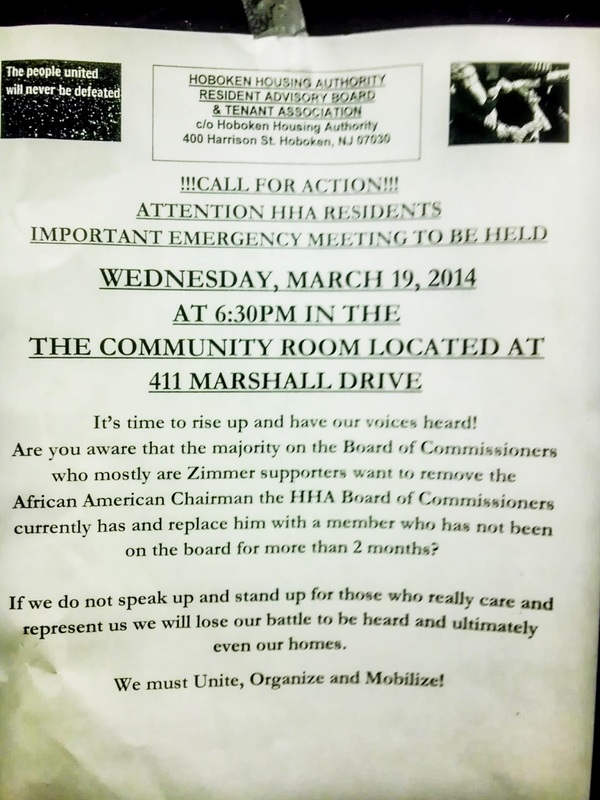 Recall when residents skeptical of Vision 20/20 put up some fliers, it led to to immediate threats of eviction. Later one eviction notice was converted into a cease and desist order by holdover legal counsel Charles Daglian. First a little truth on this latest sad spectacle of race baiting. A resolution to allow for a possible reorganization at last Thursday's HHA board meeting was introduced but it did not follow with any change of the chair. The resolution presented an option to do so upon 90 days after a change in the composition of the HHA board. Any subsequent legal action to reorganize the HHA board did in fact not occur. But Carmelo Garcia obviously fears it may yet take place before the May annual reorganization meeting and lead to the board exercising its authority. How can Carmelo Garcia who holds a legal contract to work in the Housing Authority possibly allow his bosses on the HHA board perform its function? Based on his little tape recorder, Garcia accepts the legal authority of the HHA board when talking to others but minutes later while talking to himself, he disavowed it. One can only thank Garcia for that kernel of truth captured on his trusty wire. It's unclear if a board vote was held and recorded by the stenographer updating the bylaws. An attempt to introduce a resolution was being yelled down by the board secretary Carmelo Garcia and the Carmelitos along with the sudden inspired backing from Charles Daglian who changed his uncertainty from the last meeting where he claimed to be unsure if the typical application of Robert Rules exists in the contracted Carmelo Garcia Banana Republic. Daglian joined with the Carmelitos perhaps concerned about his own holdover contracted status and found suitable inspiration to declare any resolution introduced by the HHA board under Roberts Rules "illegal." As for the Chairman Rob Davis, he's merely following orders insisting no resolution can be introduced and brought to the floor for a vote, legal rules be damned. The contracted Banana Republic of Carmelo Garcia deems it so. Talking Ed Note: There's satirical elements here but the facts along with the poster pictured above are accurate. The last major public budget in Hoboken has not been properly audited and reformed until a HHA board performs its proper oversight and fiduciary responsibility for the agency. Until then, who knows what other illegal actions and possible criminality are hidden? Before that can happen, the HHA board needs to be reformed from being a rubber stamp by a megalomaniac wannabe dictator and see the rule of law applied.